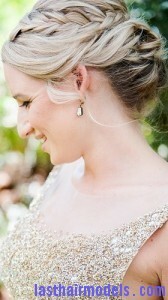 A braid wrapped chignon is a very unique way of styling the hair for special occasions such as a wedding. It is important to have a medium to long hair to achieve this hairstyle perfectly or in case you have a short hair try to add hair extensions. 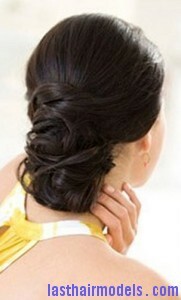 You can also backcomb the hair to add more volume to the chignon. Use this technique to create this hairstyle at home without any help. 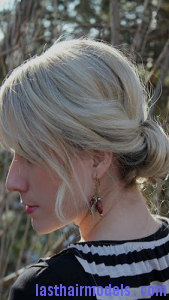 To get this style, first pull a piece of hair just next to ears to braid it like a normal braid. Secure this hair away from the styling process and then pull a little section of the hair in the front such as two on the side of the head that must be tied together at the back of the head. Now rest of your hair must be collected to create a very low ponytail at the back of your head. Take your low ponytail to fold it on your hair which was tied together in the front and try to tuck your hair a little bit by slightly adjusting to make it look good. Use bobby pins to secure the hair and take the braids falling down from sides. 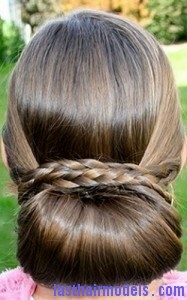 Try to cross your hair braids at the back over the chignon and try to keep it in place just under the braid. Make sure that the ends of the hair have been hidden and spritz all over the hair with a hairspray to end the hairstyling.